This morning I was back up at Bolton to see how the powder was doing. The freezing line had certainly crept upwards from where it had been yesterday, and even up at the main base (2,100’) there was a thick melt crust on the snow. I could see that there had been a lot of activity on the slopes yesterday, and everyone’s tracks were frozen up. The resort had run a groomer right up Beech Seal, which was probably very helpful yesterday with the deep snow, but it wasn’t much help this morning. It was still the most attractive ascent option, but anyone who has skinned on frozen cat tracks knows how the hold of skins can be tenuous. My arms got a good workout on some of the steeper pitches as I struggled to hold ground. When I found that the crust was still present even up above mid mountain, I was getting ready to just descend and call it a workout, but I had some time and decided to keep going to the big Sherman’s Pass switchback at 2,800’. Right around there I saw the first traces of more decent snow, so I pushed on to the Vista Summit. The melt crust was certainly decreasing by that elevation, although now that I was up near the ridge line, a wind crust was taking its place in exposed areas. I finished my ascent via Sherman’s and Hard Luck Chute, wrapped around above the Vista Quad summit station, and de-skinned near the top of Alta Vista. The wind was ripping through there pretty nicely, maybe 20-30 MPH from what I could tell. I found a spot out of the wind, and there actually was some nice medium weight powder in protected spots at that elevation. I headed down Alta Vista, which had a couple of tracks in the steeper section up top, but those folks had retreated to Sherman’s before the more moderate grade. Presumably they wouldn’t have been moving well without the steeper pitch yesterday. Now that the snow had consolidated a bit, I was able to ski out the rest of the untracked Alta Vista. The snow wasn’t billowy and light like it had been yesterday morning, but it was still decent. I was glad I’d had those turns though, because below the Sherman’s Pass switchback it was pretty much survival skiing with the return of the crust. Staying in my skin track was too fast without the option to bleed speed by wedging, and staying out of the track was just really tough with a semi-breakable crust – even skiing in alpine mode. When possible, I actually worked out an interesting solution for that part of the descent. I kept one ski in my skin track, and one ski out in the crust, and regulated speed by shifting my weight between the two. Below mid mountain, I took the Bear Run route as the easiest/safest option. Back down near the base, there were the very faintest first signs of the snow softening, so with that change there was hope for better skiing later in the crusty areas. I saw what looked like a father and son just starting up for a hike, and hoped they knew what they were in for. So overall it was a good quick workout, with a bonus leg workout on that difficult descent, and at least some nice turns up high… but nothing in the league of yesterday. 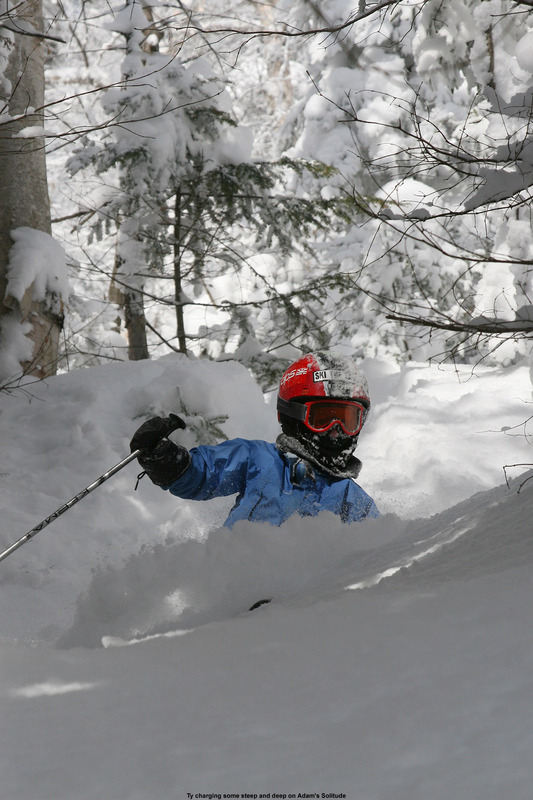 We’d had a good run of four small powder days during the April 16th, 17th, 18th, and 19th stretch that had gradually resupplied the area’s ski slopes, and in some cases made for wall to wall snow coverage right back down to the base elevations. However, spring warmth and sunshine returned during the midweek, and the lower slopes quickly lost the new coverage. At the end of the week I’d casually glanced at the forecast and saw that there was eventually another round of moisture coming in with valley temperatures around 40 – hinting at another potential round of elevation snows. 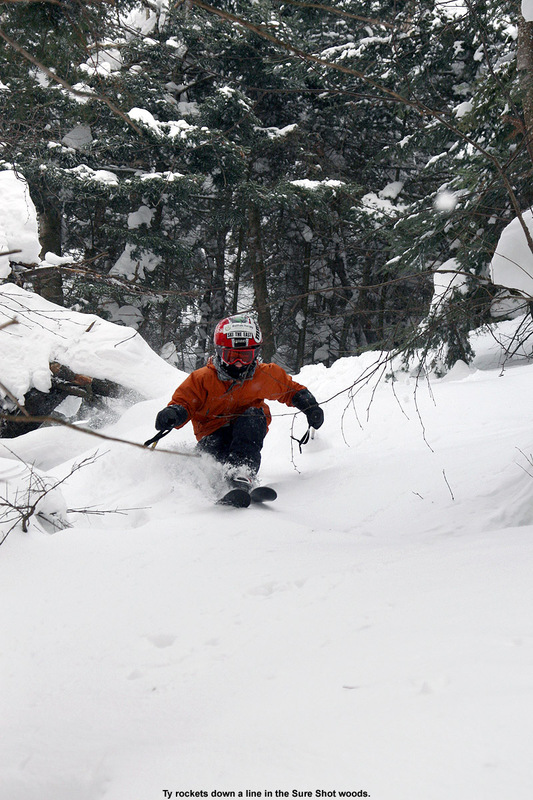 Still, it was nothing obvious in terms of snow production, and another round of powder was far from our minds as we were back to spring skiing on Saturday at Killington. .SHORT TERM /6 PM THIS EVENING THROUGH WEDNESDAY/… PERSISTENT WRAP AROUND MOISTURE AND COLD AIR WILL PROVIDE THE INGREDIENTS FOR A LATE SEASON UPSLOPE SNOWFALL ABOVE 1000 FEET IN THE DACKS AND NORTHERN GREENS. 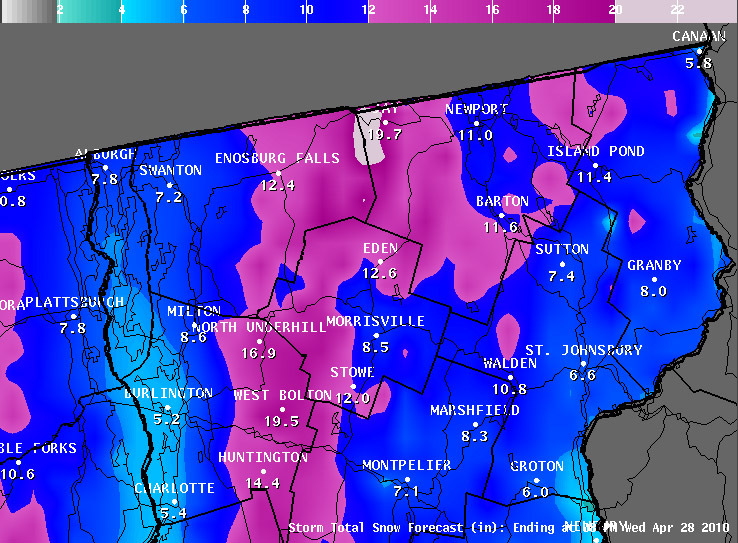 LOOKS LIKE JACKPOT SPOT WILL BE JAY PEAK WITH FAVORABLE NORTHWEST FLOW OVER MORE THAN 24 HOURS. HAVE HOISTED WINTER STORM WATCH FROM 12Z TUE THROUGH 20Z WED. PRECIPITATION WILL BEGIN AS A RAIN AND SNOW MIX ON TUESDAY…CHANGING TO ALL SNOW AS COLD AIR FILTERS INTO THE REGION. HEAVIEST SNOW WILL LIKELY FALL TUESDAY NIGHT AS TEMPERATURES DROP BELOW FREEZING ACROSS THE FORECAST AREA…MAINLY ABOVE 1000 FEET…AS PERSISTENT NORTHWEST FLOW CONTINUES. SNOW WILL CONTINUE INTO WEDNESDAY ACROSS THE HIGHER TERRAIN AS COLD AIR ADVECTION KEEPS TEMPERATURES BELOW FREEZING AND PRECIPITATION WILL STAY MAINLY ALL SNOW…THEN MIX WITH RAIN BEFORE ENDING DURING THE AFTERNOON. 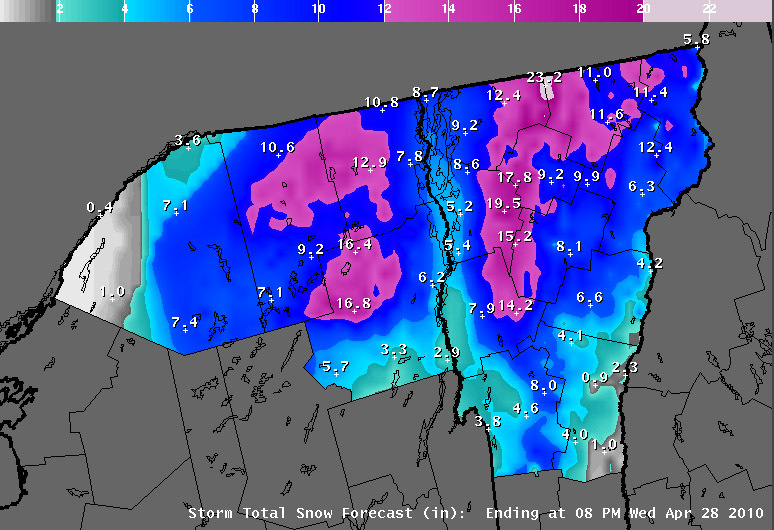 BY WEDNESDAY AFTERNOON SNOW ACCUMULATIONS MAY EXCEED 9 INCHES ABOVE 1000 FEET…WITH MORE THAN A FOOT POSSIBLE IN THE JAY PEAK AREA. On Monday evening, Powderfreak weighed in with a few weather thoughts, and he said that things were looking very good for an “absolutely classic Northwest-flow upslope event along the Green Mountains”. 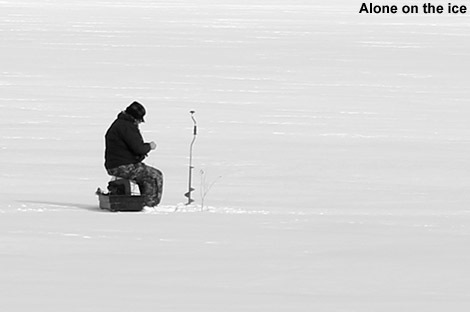 For those that like plenty of snow in the Northern Greens, that’s music to the ears. 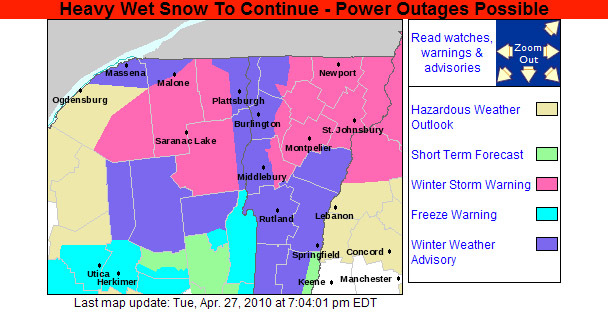 The updated forecasts were generally on the mark, although I think some people were surprised by how quickly the rain changed over to snow down in the Champlain Valley. At my UVM location (elevation 380’) in Burlington, the precipitation had already changed over to snow by 7:45 A.M. on Tuesday, and Powderfreak started to send in pictures from his place in Jeffersonville showing the onset of snowfall. 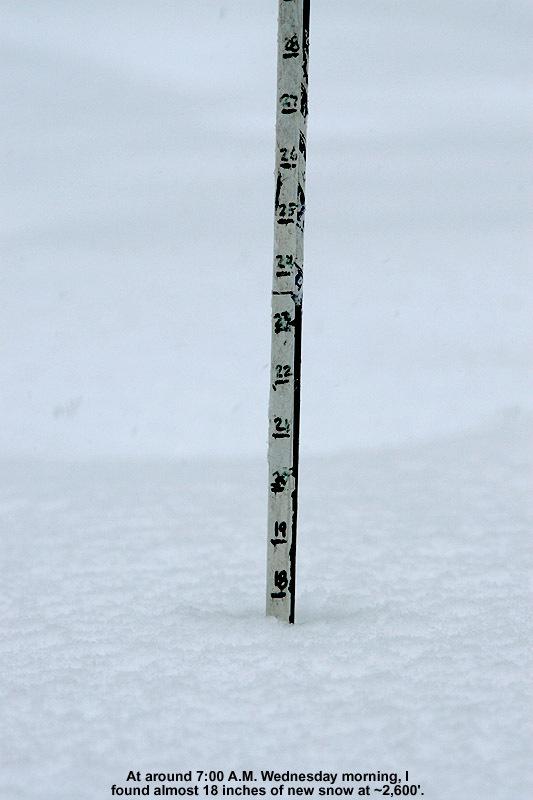 The snow continued throughout the day, and back in Waterbury at the house (495’) we’d picked up 3.0 inches by 6:00 P.M. 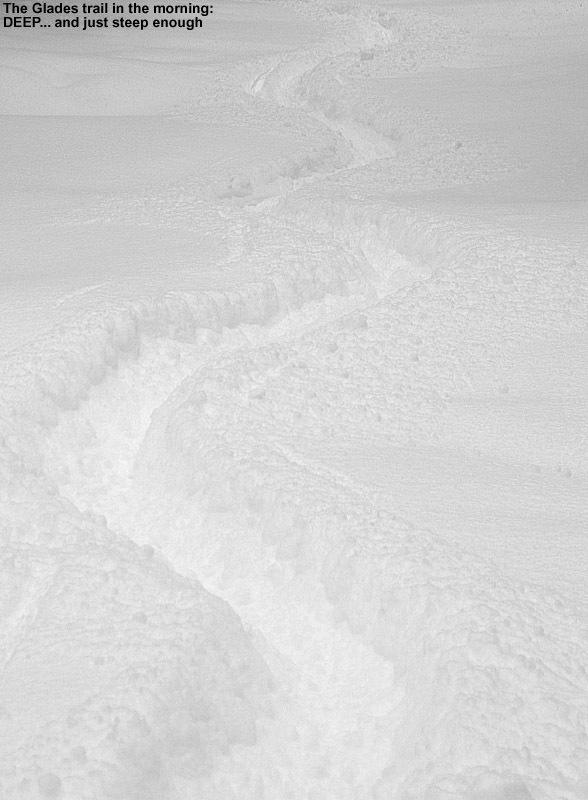 The west slopes of the Northern Greens were getting quite a pounding, and once he got his power back on, Powderfreak sent in some pictures of the area from Tuesday evening. Driving up the Bolton Valley Access Road, there was no real snow line to report on like the previous events, since substantial accumulating snow had fallen all the way to the valley. Instead of a snow line, there was a dramatic increase in snowfall amounts resulting from relatively minor increases in elevation. 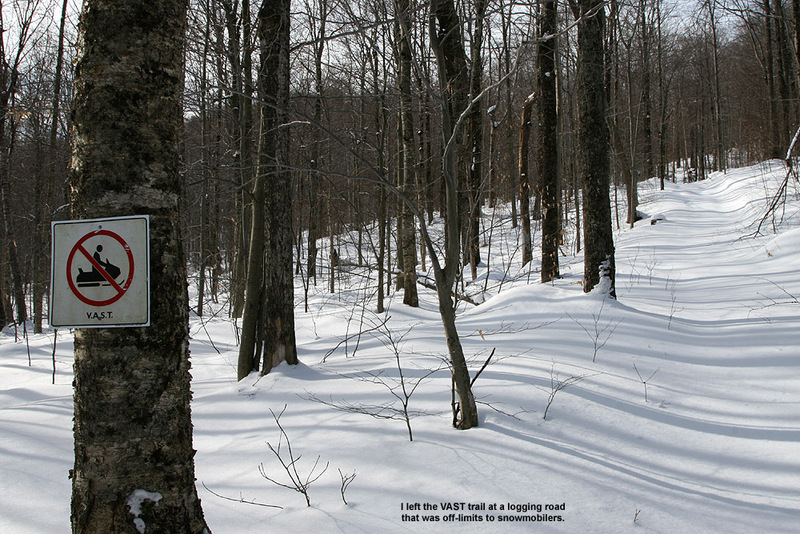 The 3 to 4 inches of snow at the base of the access road (340’) had more than doubled by the time I got up to the Bolton Valley welcome sign at around 1,000’. Those trees in the lower elevations that had decided to partially leaf out were a little worse for wear. Many were bent under the heavy snow, and in a couple of spots there were broken limbs on the road that required some negotiation. As I ascended higher, the trend of bent trees gradually decreased as the trees had fewer leaves. I couldn’t get a sense for how much snow was on the ground at the base of Timberline (1,500’) but there appeared to be plenty of snow for skiing right there. I continued on upward to the main base of the resort however, figuring I might as well maximize the available snow, get to the driest snow, and make use of the old base that was available on the upper mountain in case it was needed. The Bolton Valley Village (2,100’) had a temperature of about 30 F, and it was really in the midst of winter’s fury; there wasn’t too much wind, but big flakes of snow were coming down in the 1 to 2 inch/hour range. I was early enough that only minimal plowing had been done, so my first priority was to find a place to park without getting myself stuck. I opted for the little parking lot just below the lodge. It wasn’t plowed and had about a foot of snow in it, but it’s flat and generally well drained. The Subaru did a nice job of plowing through that untracked snow. I geared up and started getting some better measurements of the new snow; I found 12 inches on the ground, and 15 inches on elevated surfaces at the base area. Boy was that snow pounding down! It made me wonder just how deep the snow accumulations were ultimately going to get. I saw not a single track of any sort of vehicle or skier anywhere on the slopes, and it was quickly obvious that I was going to be breaking trail. The snow was reasonably light, perhaps 8% H2O or so, but there wasn’t any notable density gradient that I could find in the accumulation, so I was sinking way down into it. There’s something to be said for smaller snowfall events and those days that the resort puts down a nice groomed surface for travel. 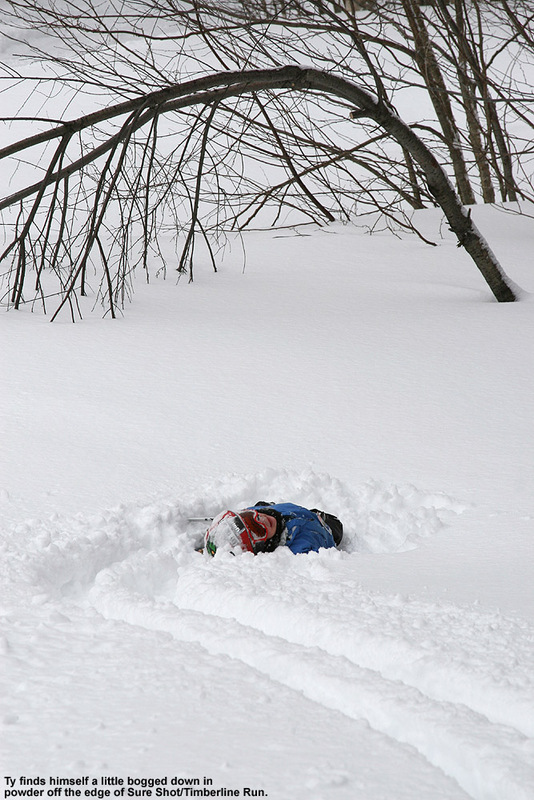 I opted to skin up the Bear Run route, not wanting to tackle the steeper pitch of Beech Seal in such deep snow. I trudged upward, creating a skin track at what felt like and excruciatingly slow pace. I meandered a bit with my ascent route, using any sort of moose track, deer track, or other imperfections in the snow to gain an edge on breaking trail through the deep. It was amazing, but even just a little compaction left by an animal trail made quite a difference in the ascension effort. The slow ascent meant my time was running shorter than I’d expected, but I could also tell from the snow that I was going to need to hit the steepest slopes I could find to get moving. I opted to ascend in the New Sherman’s Pass area, shooting for a descent of Upper Glades/Glades. I stopped at ~2,600’ atop Upper Glades, measured the depth of snow at around 18 inches, and prepared for the descent. Anything without pitch was almost as slow as skinning up hill, but fortunately I could make turns on the steeper pitches. 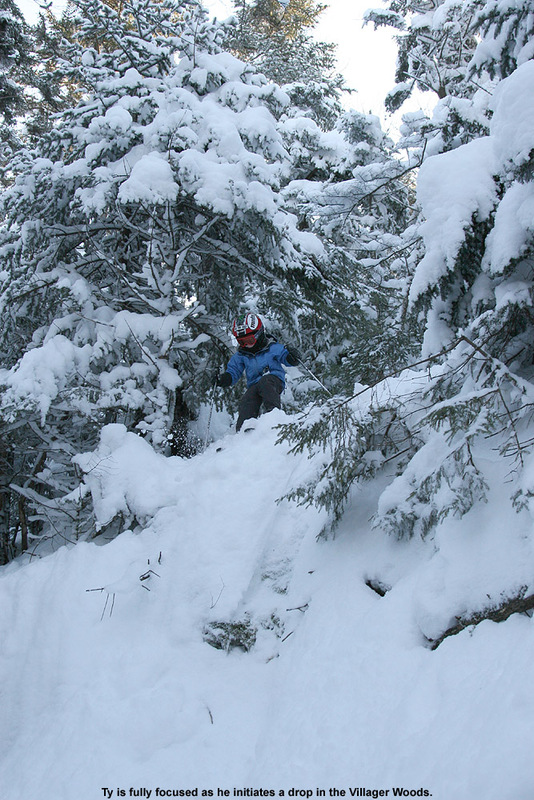 The skiing on the steeper pitches was just as one might expect – a deep, full on powder wake-building experience. 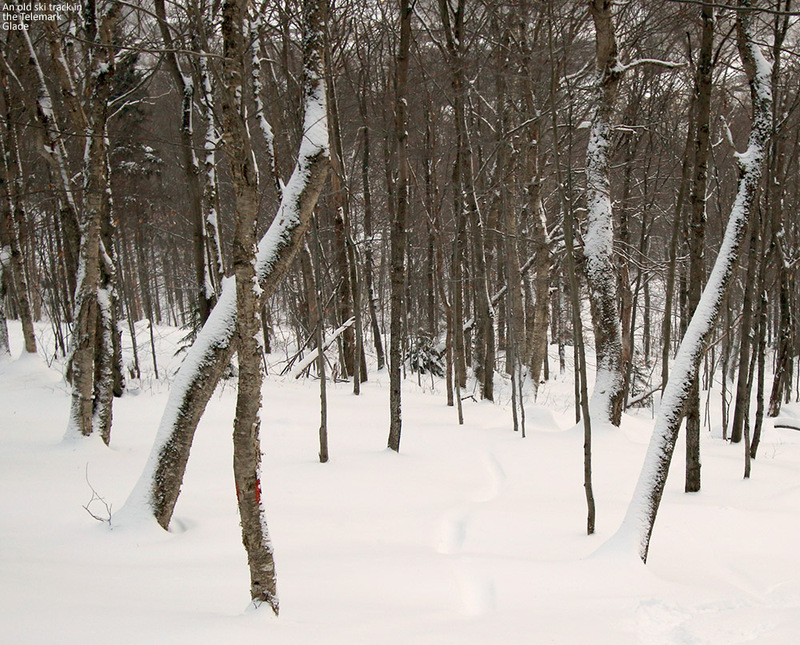 I opted for the Chute on the left side of Glades, and got some pretty decent turns out of that. Returning back to the base through flat terrain was another experience in trudging, one of the slowest returns to Beech Seal I can recall. I didn’t have time to recheck any snow depths, but my car already had another inch plus of snow on it when I got back after my short tour. I was hardly prepared for that, and had to dig out my snow scraper to clear it all off. On the descent of the access road, I saw two utility trucks that were presumably working on lines affected by the storm, and there were still a couple of trees/branches down in the road. Even back in Burlington, the snow was still coming down like a blizzard. Although the snow wasn’t accumulating like it was up on the mountain, it was dumping with fury and plenty of wind as I walked from my car. There was actually a rather interesting snowfall situation going on in Burlington on Wednesday morning. One of our graduate students lives down in the hill section of town, probably at an elevation a bit under 200’, and at his apartment that morning there was no snow. He’d seen the snow on campus the previous day, but based on what he observed at his place that morning, he figured it was all rain in the area. He started heading up the hill to campus, totally unprepared for what he was going to run into. About halfway up the hill he started seeing slush accumulations on the ground, and by the time he got to our part of campus at around 380’, he was into that raging blizzard with strong winds, heavy snowfall, and the ground covered with a few inches of wet snow. I’m not sure if it the lake had any part in it, or if it was simply elevation, but that was quite a sharp gradient in terms of accumulations. Later in the day on Wednesday, the snow in Burlington changed over to a bit of rain before tapering off. I had contemplated heading back up to the hill for another run in the late afternoon, but just ended up having too much to do. 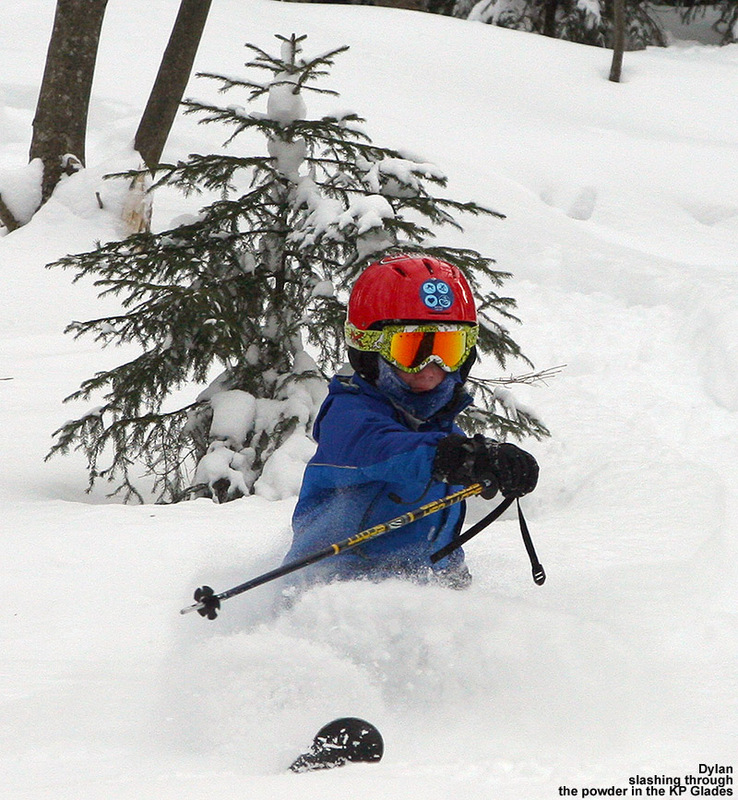 Another student I know did head up for some afternoon turns at Bolton and said that conditions were nice. The resort had actually run a groomer up part of the mountain which made travel much easier, and he got some steep turns up on Hard Luck and Spillway. 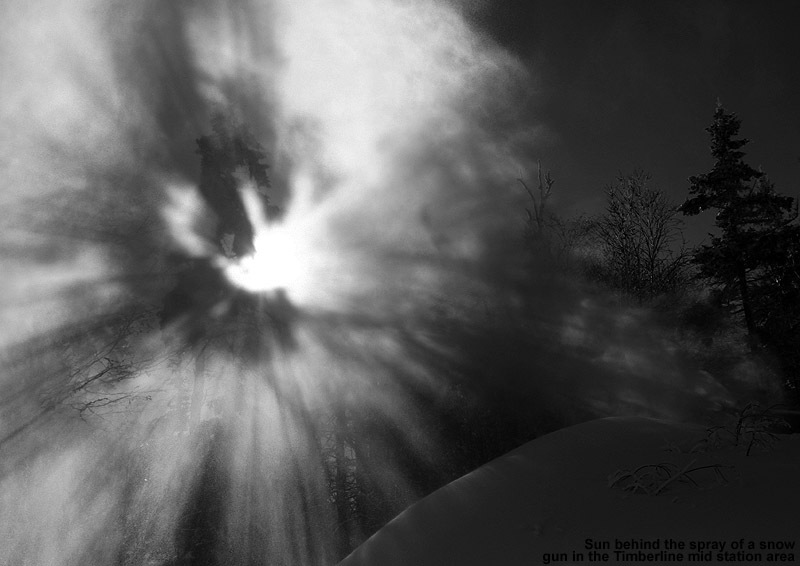 Powderfreak sent out another couple rounds of pictures from the event, some from the higher elevations of Mt. Mansfield, and another round from the valley. Many thanks Powderfreak for doing such a thorough job of documenting the snowfall in his corner of the western slopes of the Greens. By the time I was leaving UVM, skies were starting to clear and the sun was lighting up areas of the mountains. 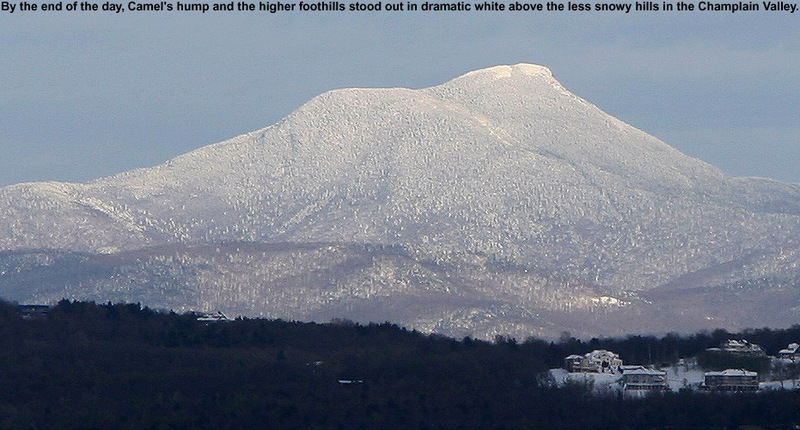 It was easy to see the substantial coating of white that had been put down on the mountains and higher foothills, while the trees in the lower hills in the Champlain Valley weren’t really covered. I grabbed a quick shot of Camel’s Hump before heading home. It seems that as of this season, Dylan has finally reached the point where he could handle a day of spring bumps at Killington, so we headed down for some skiing on Saturday. We were actually hoping to bring the boys out for some Superstar mogul bashing in May, but rumor had it Killington’s lifts might be done after the weekend. With nice sunny weather available, we decided we’d better get down there. Although the drive down is only about an hour, it was replete with unexpected scenery that was in places, rather amazing. I’m not sure if it was because of the very early onset of warmth we had at the end of winter, but something has conspired to make this spring’s foliage some of the more colorful I’ve seen. Because of the way that the various yellows, greens, oranges, reds, purples, pinks, and even white are coming out, it’s acting like a second round of fall in terms of foliage. I’ve not noticed it much around Waterbury and Burlington, but we started to see frequent foliage displays in the Randolph area along I-89, enough that I had to actually pull out my camera as we approached the White River Valley. 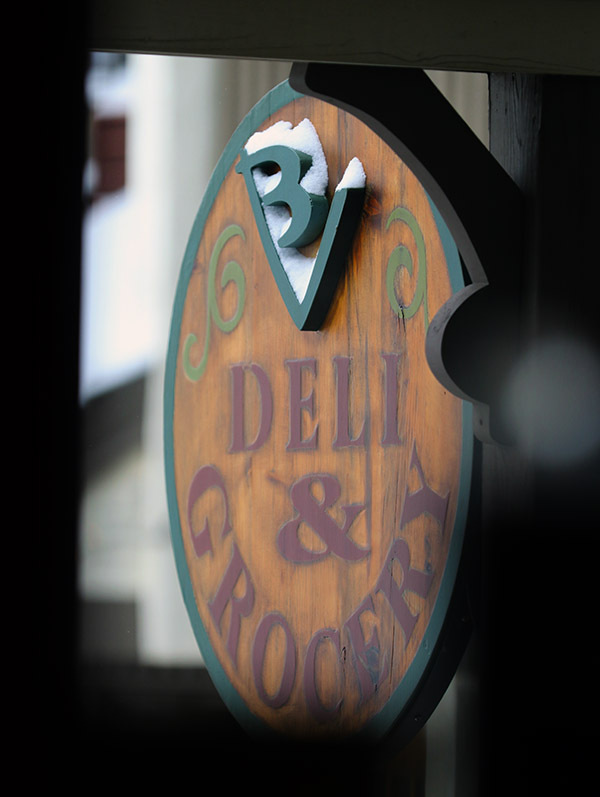 We found impressive views of color through Bethel and Stockbridge, and even down to the Pittsfield area. The White River certainly wasn’t raging, but it was looking as beautiful as ever and we saw lots of people out in Canoes and Kayaks. South of Pittsfield, the foliage colors seemed to taper off as we got into the higher peaks of the Killington area, where few if any leaves were out. 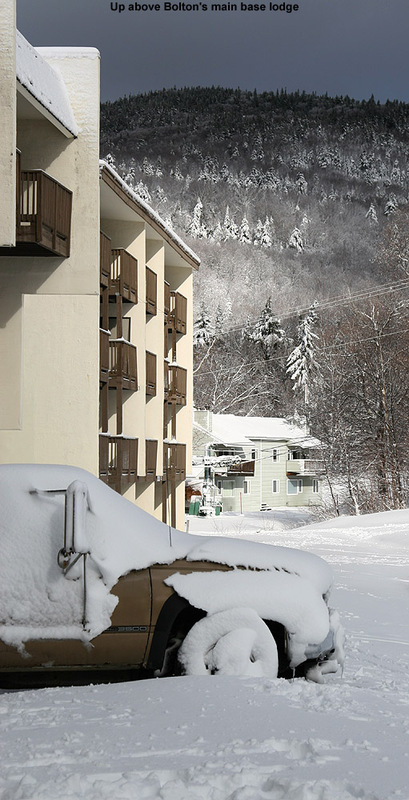 Views of the snow on Killington’s slopes were visible from way back on I-89, and we pointed out the views to the boys. 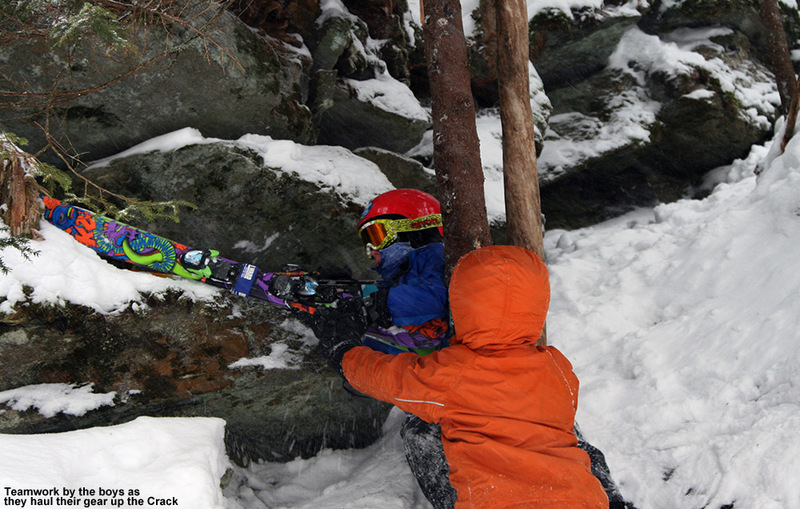 The boys have been down to Killington in the fall, but it would be a new area for them in terms of skiing. In fact, it was the first time that any of us have been skiing at Killington since returning from Montana, and the first time we’ve headed south of Waterbury for lift-served skiing this season. We told the boys that between the bump skiing and party scene that is Killington in the spring, they would be in for quite an experience. I generally haven’t headed down to Killington for spring skiing until May, and there were certainly more people partying it up than I was used to, but also more trail options. The mountain has usually been down to just Superstar when I’ve been there, but on Saturday they also had Skyelark and Bittersweet available. 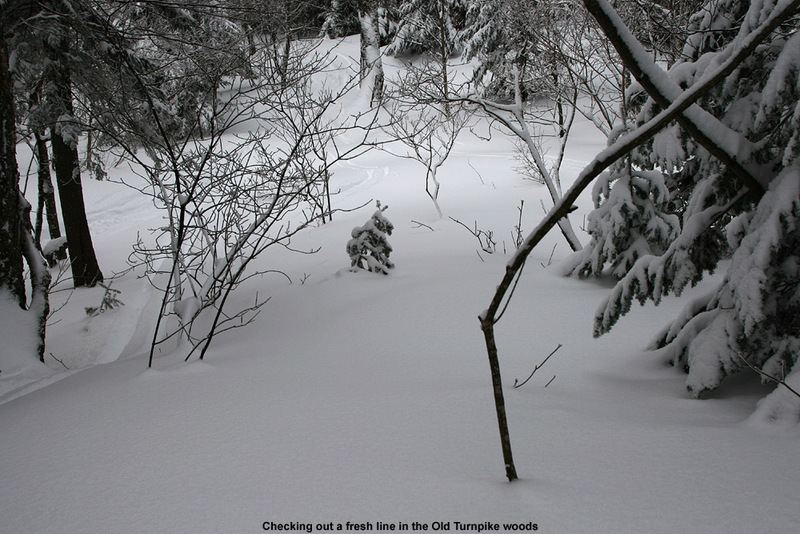 There was also plenty of snow on the trails up near Killington Peak for those that wanted to traverse or earn some more secluded runs. Ty was pretty funny at the start of the ski day. I think he generally skis enough that he’s not bursting with anticipation to get on the snow, but as we first rode the Superstar Quad on Saturday and he saw what the skiing looked like, he blurted out something to the effect of, “I just want to jump off right now and ski!” We got a kick out of his unexpected enthusiasm. Coverage was generally wall to wall on Superstar with just a few spots of thin cover that warranted caution. If the boys ever sat down to rest or wait for others in the group, they would disappear below the sea of bumps. If just their heads were sticking out it looked a lot like they were swimming in a white sea. Bittersweet was lots of fun, with some mellower bumps, and we did two round of follow the leader on there that the boys really enjoyed. After Dylan was kaput, E took him to the car while Ty and I hit a final run on Skyelark. Skyelark had a section near the bottom that was getting thin with the best tracks on the sides, and unless they moved any snow it would probably be the first route to become discontinuous. I will say that after spending my first day riding Superstar and friends on Telemark skis, I have an even greater appreciation for Rossi at all those annual Broken Rib/Missing Tooth Tour days at Killington. On the way home we wanted to stop at the Peavine Restaurant/Pub in Stockbridge, but noticed that they weren’t opening until Sunday, so we continued on into Bethel and ate at Cockadoodle Pizza Café – everybody loved the name. It feels like an old house, with some of the various rooms serving as seating areas with eclectic mixtures of tables and chairs. So after a weekend with a definite spring skiing feel, it sounds like we could be back into some powder for the midweek period. At this point, Jay Peak appears to be the hot spot with roughly a foot or more of snow anticipated, but potential accumulations look nice right down the spine of the Northern Greens through the Mt. Mansfield/Bolton/Camel’s Hump area. 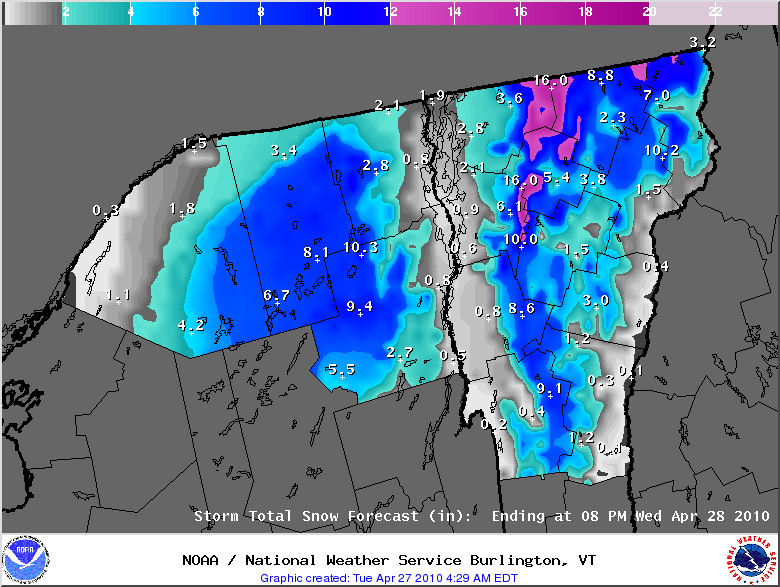 The predictions on the latest storm total snow forecast maps from the Burlington NWS even look like they have jumped up a bit from where they were this morning. Powderfreak says it’s a classic northwest upslope flow setup, which is good news. We didn’t seem to have quite the payload of upslope events this season compared to what we sometimes get, so hopefully it will be another nice reprise of winter with some powder days like we had a week ago. We’ll see how it plays out. Today I headed up to the mountain for the final round of snow from the weekend system. The first traces of snow on the ground were again around the 1,800’ level along the access road, and the temperature was near freezing in the village (2,100’). It was hard to tell with some of the older accumulations of snow still hanging around, but I don’t think there had been much new snow accumulation at the base elevations since I’d last been there yesterday morning. There had definitely been some precipitation since that time, but I suspect the temperatures kept new snow from sticking in the village. Thanks to what had fallen before, there was at least some snow coverage all the way to the base elevations, but my first encounter with the snow revealed a surface that wasn’t that inspiring. The freezing line had gone up yesterday, and now that it had come back down, those areas with wet snow were crunchy and any impressions in the snow were locked up like hardened plaster. I was confident that temperatures had stayed low enough in the higher elevations though, so I suspected there were going to be some good turns up there somewhere. I hopped on my usual skin track at the bottom of Beech Seal, but eventually diverged to set a new track up Sprig O’ Pine and Cobrass Run to get to Cobrass itself. After a few days of skinning across Cobrass Lane, I was feeling like this new route might be a more direct way to get to Cobrass. As I was first skinning through the crusty snow at the base, I wondered how that stuff was going to transform into the quality snow that I suspected to find up high. Watching the transformations in snow quality or depth as one ascends is always interesting to me, and yesterday revealed quite a diverse snow/elevation profile in just a thousand feet of elevation gain. For the first couple hundred feet of the ascent, I didn’t notice much of a change in the snow consistency, and then with each plant of my pole I had the feeling that the crust was getting thinner. Soon, with flicks of my pole I found what appeared to be powder sitting on top of the crust, almost unperceivable at first, but it was soon obvious. It was eventually hard to say if the crusty snow was getting softer, or the powder on top was getting deeper, but by the time I’d reached mid mountain (-2,500’) I was skinning through some decent fresh snow. The crustiness was gone, and the transformation from that point was just an increase in lighter powder atop a gradient of denser snow below. It looked like the skiing was going to be very nice on the top half of the mountain. As I ascended Cobrass, I encountered powdery drifts in the range of 6 to 12 inches on top of the previous rounds of snow, and with a bit of wind and temperatures below freezing, it was actually starting to feel a lot like winter again. 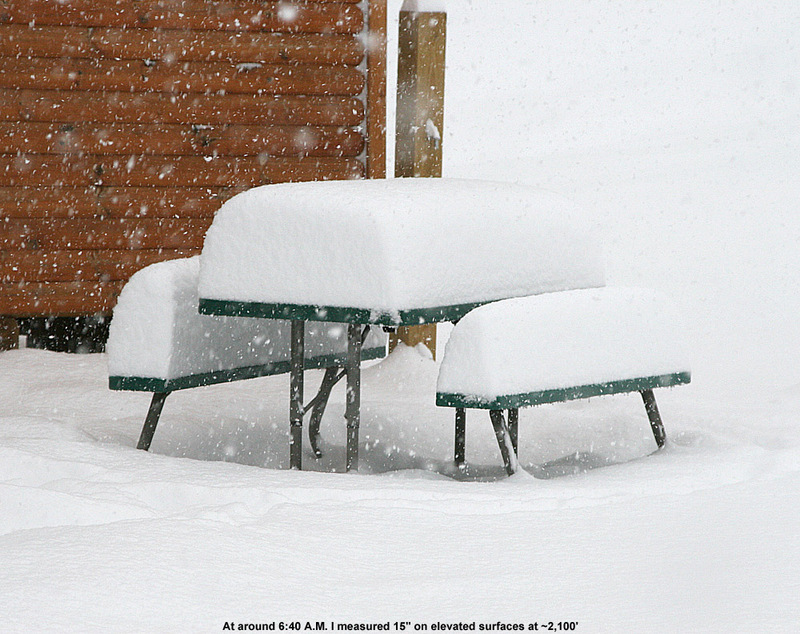 By the Cobrass picnic table at roughly 2,900’ I took the opportunity to get a settled snow measurement for the whole event, since it looked we’d seen our final round of snowfall. I measured just shy of 8 inches of depth on the seat of the table, and the top of the stack actually featured some pretty dry snow. I finished my ascent and checked on the snow plot I’d been monitoring to find that the depth of the overnight snowfall was right at three inches. With that in the bank, it put the event snow totals at around 3 to 4 inches at 2,100’, and 11 to 13 inches at 3,100’ based on what I’ve seen over the four days of snowfall. Down at the house this morning, I’d recorded my final precipitation from the system: 0.23 inches of liquid for the previous 24 hours. That brought my valley precipitation total to 2.06 inches, so presumably the mountain picked up at least that much liquid, and in the higher elevations, most of that is still locked up in the snowpack. For reference, measurements at the Mt. 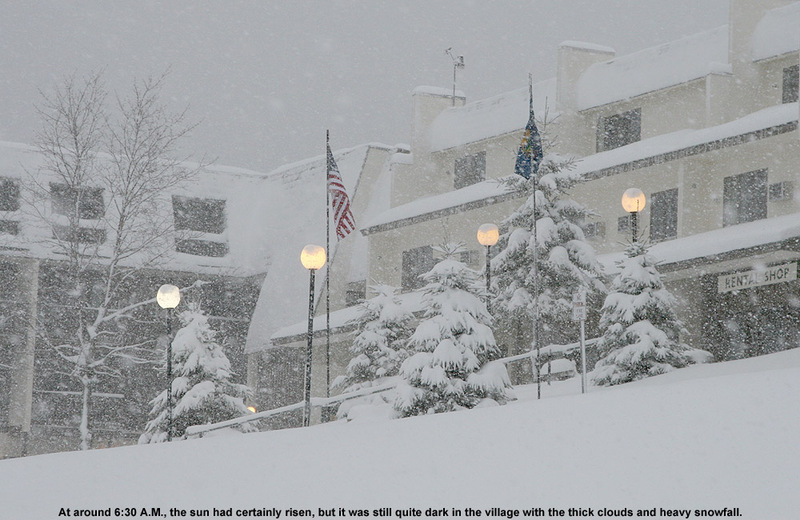 Mansfield stake recorded 11 inches of snow and 3.17 inches of liquid equivalent for the period, and on Mt. 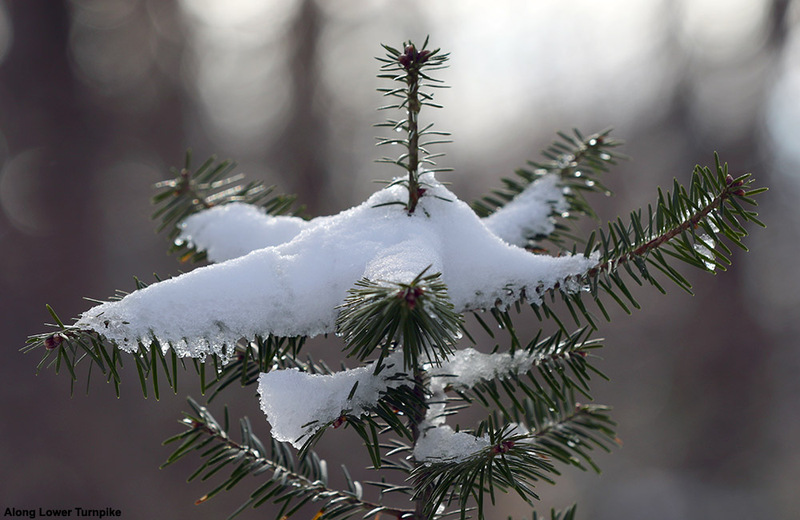 Washington, 15.2 inches of snow and 1.72 inches of liquid were recorded. 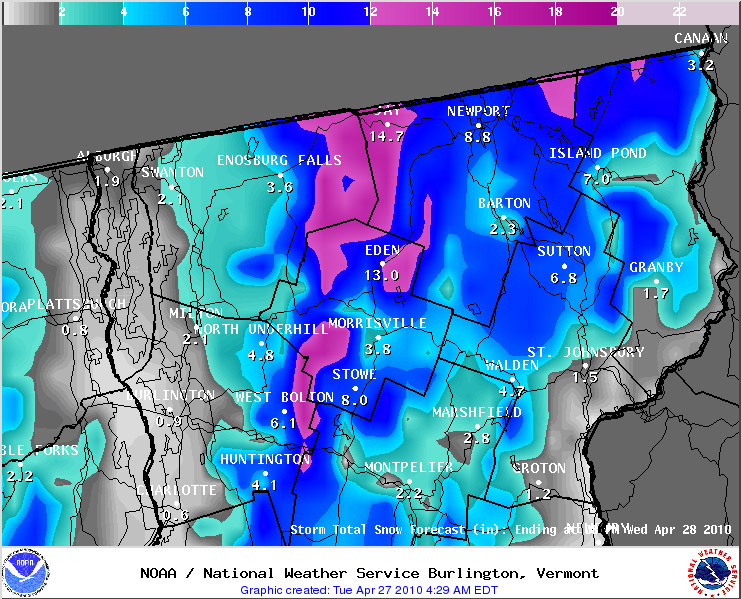 In any case, this event certainly gave a boost to the snowpack in the higher elevations; the snowpack at the Mt. Mansfield stake went from 43 inches on 4/15 to 54 inches on 4/18. The sun started to come out while I was putting away my skins, so I grabbed a few more photos and then it was time to ski. I could say that today was the crème de la crème in terms of skiing with this system, but it may not have been, and each day had its strengths. Today won hands down in terms of snowpack of course. The continued accumulations of dense snow really made skiing practical on all but the steepest/ledgy runs or those with substantial underlying debris. Also, today the upper mountain was topped off with some of the driest snow accumulations that I’ve seen over these past few days. But, wind definitely did some work up high, packing the powder down in some areas, and the skiing was crusty and not too fun below mid mountain. After checking out Spillway and Hard Luck, I could see that the wind had worked them a little. I didn’t have the time for multiple runs, so I opted to go with some turns down Sherman’s Pass because I could see it was a sure thing. The turns on the upper half of Sherman’s were really nice. While skiing, I still only sunk down into those first few inches of light powder, but below that layer was a gradient of denser snow that was really smooth and soft. Turns were decent down to about 2,400’, a bit below mid mountain, and below there it was still crusty and I just skied it out. Certainly lapping the upper half of the mountain was the way to go if one had the time. Just as I was approaching the base, I ran into Nile starting his ascent, and we chatted for a minute while I gave him the lowdown on the conditions I’d seen. He said I’d be heading into more sun as I went into Burlington, and he was right. The clouds gradually dissipated as I headed out of the mountains, and in Burlington it was getting really nice, even though there was still a bit of breeze. The mountain has certainly been transformed with this event, brining nearly wall to wall coverage to most places above 2,000’. I would expect the lower mountain areas to improve with the warming (although the lowest elevations will probably melt out quickly) and on the upper mountain, the quality of turns will probably drop a bit from where they were until the snow can be cycled into corn. 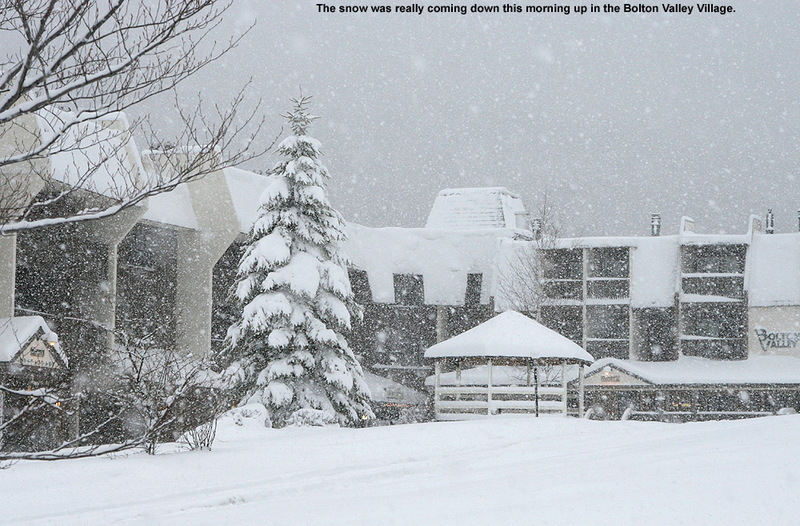 Today I headed back for a morning session at Bolton to check out last night’s new snow. I’d say the snow level only dropped down to somewhere in the 1,500’ range last night, but it was enough to whiten up everything in the valley from 2,000’ on up with a new round of snow. I saw the first traces of new snow at around 1,700’ on the drive up the access road, just a touch below where I’d first seen the snow yesterday afternoon. Snow accumulations on the road itself didn’t appear until about 2,100’, right as I approached the village, and the temperature there was right around freezing. There was about an inch of new snow in the village area, and the sun was actually peeking out of the clouds when I first arrived at the mountain. My skin track on Beech Seal was buried, but still visible. Accumulations at mid mountain were 1 to 2 inches, and up at the Vista summit there was 3 inches of new snow. That puts the event snow totals at around 3 to 4 inches at 2,100’, and 8 to 10 inches at 3,100’ based on what I’ve seen over the past three days. This latest round of snow was dense as the others have been, and up at the Vista Summit there’s now about 4 to 5 inches on top of the crusty layer from Friday, although at the top of this latest batch of snow there is a weaker crust that may have developed from rime or wet snow freezing up. The snow accumulations are really starting to build up now, and there are a lot of terrain options that weren’t there a couple of days ago – especially on the upper mountain. Although there was no precipitation during my ascent, when I started my descent from the Vista Summit at around 10:15 A.M., it had just started to snow, and even as I dropped in elevation, the snowfall intensified. Hard Luck clearly had enough snow for turns, so I made a descent on part of it. It’s steep enough that even with the good accumulation of dense snow I was still touching down to that crusty layer, so I only did a partial descent and then hiked back up so I could get in a run down Sherman’s Pass. I actually found that the best turns this morning were not at the very highest elevations, because that new weak crust was thickest there and made the skiing a bit tricky. However, after a couple hundred feet of descent that crust got thinner and the skiing got better and better. The very bottom elevations of the mountain are still a bit thin on coverage, but turns were good essentially all the way back to the base. I’ve been watching that skier’s left section of Beech Seal over the past few days, and finally felt that the snow was right to hit it today. The turns were so good that I quickly made another run at it and put some figure eights on my tracks. The fun part about that run was that I was actually able to skin right up Beech Seal without putting my skins back on. The consistency of the snow was such that I could stick if I wasn’t sliding, so that made for a very quick lap. It took about a turn or two to convince my skis to get back into sliding mode after ascending, but once they did it was very smooth. It almost felt like going the wax route on cross country skis. By the time I was leaving, steady snowfall was coming down in the village, and the precipitation was snow all the way down to 1,100’ before it changed over fully to rain. We’ve had on and off rain down here at the house all day from this latest round of precipitation, so there should be yet another accumulation of snow up in the higher elevations. The mountain was pretty quiet while I was there, but I did see one person ascending with his dog at mid mountain on my way down. This morning I found another 0.80 inches of liquid in the rain gauge, which represents the 24-hour total since yesterday morning and brings the event totals at this location (elevation 495’) to 0.3” snow/1.32” liquid. It did snow here for a bit in the morning, but there was no additional accumulation down at this elevation. Watching the radar and forecast trends, I decided that I’d head out for an afternoon session of skiing today. There was a lot of moisture pushing in from the west, and I was hoping that it would add some additional accumulation in the mountains. Looking out across the valley during the day, I could see that the hills had accumulations of snow down to somewhere in the 1,000’ to 1,500’ range. It continued to rain in the valley, and the temperatures were sitting around the 40 F mark for quite a while before things warmed up a bit later in the day. I headed up to Bolton Valley in the 3:00 to 4:00 P.M. range this afternoon, and at that point the temperatures in this part of the Winooski Valley (elevations 300’ – 500’) were in the mid 40s F. Ascending the access road, I could see that more snow had fallen since yesterday, and the higher elevations were coated in another round of bright white. The temperatures were warmer and the distribution of snowfall at elevation was different than what I had encountered yesterday morning; whereas yesterday morning I saw the first traces of new snowfall at around 1,200’ on the access road, this afternoon they didn’t appear until roughly 1,800’. The temperature at the main base area (2,100’) was around 37 F when I arrived there, and there was about an inch of new snow on the ground. There was a little precipitation in the air, which was just a few spits of rain. I could see that the freezing line had crept upward from where it probably had been earlier, and it looked like it was somewhere around mid mountain (2,500’). I ascended using the same skin track I’d created yesterday, which in the lower elevations was still mostly visible under the new coating of snow. There was a crusty layer under this round of snow, which was presumably derived from yesterday’s mixed precipitation. I could tell that the overall accumulations of snow on the ground have been growing however; it looks like most of what was there yesterday was still around, sealed under a crusty layer, and now there’s another round of snow on top of it. Up at mid mountain (~2,500’) I found about two inches of new snow, and although I hadn’t seen any other skiers, the scene was far from quiet. The ascent of the freezing line was causing the frozen coatings on the trees to come crashing down all around me. Above mid mountain, the precipitation switched over to snow, and the snowfall gradually picked up in intensity as I ascended Cobrass. While the overall coverage on the top steep pitch of Cobrass is much better than it was yesterday, the ascent was actually a bit trickier due to the crusty layer under the new snow. Once I’d reached the lower part of the Vista Summit at around 3,100’, I checked out a protected area that I’d wiped clean yesterday to get a final number on the new snow at that elevation. I found between 2 and 3 inches of new snow, and again the measurement was made easy by the solid layer from the mixed precipitation. I wiped it clean, and I’ll use it again to see what fell at the Vista Summit if I go up tomorrow. With that thought in mind, the snowfall had ramped up in intensity while I was up there, and at around 5:00 P.M. when I was beginning my descent, it was coming down with the greatest intensity I’d seen. I’d say that it was still below the level of moderate snowfall, but it was very steady and certainly accumulating. I descended via Sherman’s Pass again, which still seems the most practical option, and there were a couple of tracks on it from other skiers that had taken it earlier in the day. I was worried about that crusty layer underneath, but the 2 to 3 new inches up there were more than dense enough to keep me off the base in untracked areas. The skiing was very nice down to about the 2,700’ level, just below the Sherman’s Pass hairpin, at which point the snow quickly got sticky. For quality turns, I’d say lapping the top 400 to 500 feet of vertical would have been the best bet, since below that level I was just letting the skis run to keep up speed in the sticky snow. So, while those upper-elevation turns were almost on par with what I skied up there yesterday, yesterday morning wins for overall turns because they were nice almost right back down to the base area. The snow line seemed to have dropped by the time I was finishing my descent, and it was almost back down to the base area around 5:30 P.M, although it was still mostly rain right in the village. Based on what I saw in terms of how the snowpack is building up and the way that first round of snow is now locked with a solid layer on top, there shouldn’t be much concern about rocks on the Sherman’s Pass/Bear Run route anymore. Even routes that had little base prior to this event are starting to look good as long as the underlying ground is smooth and grassy. Depending on how much snow falls tonight, things could be very nice tomorrow. 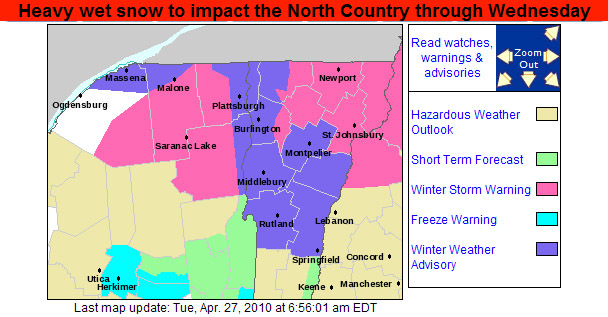 Although the NWS isn’t suggesting much in terms of accumulation tonight, the BTV composite radar (below) still shows quite a bit of moisture around, and the snow line may even drop back down to the lower valleys tonight. We’ve probably had about a third of an inch of additional precipitation here today, and it’s still raining out there. E just came back from Morrisville and said it was raining the entire time, so it’s certainly snowing in the mountains. We’ll just have to see what tomorrow brings. Snowfall came into the area last night, and accumulating snow reached down even into the Winooski Valley. The ground was whitened in the yard this morning, and as of my 6:00 A.M. report we’d picked up 0.3 inches of snow and 0.52 inches of liquid at the house (495’). Reports coming in from the higher elevations were indicating more substantial accumulations as expected. With the appearance of the new snow, I headed up to Bolton for a few turns this morning. Leaving the house (495’) at around 7:30 A.M. or so, the temperature was in the upper 30s F. As I drove west from the house, the coating of snow that we’d received quickly vanished, and there wasn’t really anything on the ground from the Chittenden County line westward to the bottom of the Bolton Valley Access Road (340’). Climbing the road, there wasn’t even a hint of snow until right around elevation 1,200’ near the Catamount Trail access below the big S curve. From that point up, the accumulations started to build with elevation. At around 1,500’ at the base of Timberline there was roughly an inch. Accumulations on the road began at around 2,000’, and up around 2,100’ at the main base I found 1 to 2 inches of new snow and a temperature a bit above freezing. There was some wind, mixed precipitation, and nobody around. I skinned up Beech Seal to mid mountain (2,500’) where new snow accumulations had increased to a couple of inches, and it was hard to tell with the new accumulations, but some of the old base snow had certainly been lost since Ty and I were up there on Sunday. There is still a really nice line along much of the skier’s left of Beech Seal, with a good base under this new snow. Above mid mountain, I skinned up Cobrass, and by around 3,100’ near the Vista Summit, I found about 3 to 4 inches of new snow. As I’d heard in some of the forecasts, snow levels were expected to rise pretty high today, and the precipitation I encountered was mixed at best all the way up to the Vista Summit. I descended via Sherman’s Pass from the summit, since many of the steeper trails seemed dicey, and with the dense snow and my longer skinny Telemark skis, there was plenty of excitement on just low and moderate angle terrain. Below mid mountain, I opted for the Bear Run route because I knew the coverage had been good on Sunday. Over the course of the entire run from the Vista Summit, there were a few areas of survival turns where I was avoiding underlying obstacles below the new snow, but in general the turns were really nice on the old base. The snow was dense enough to make things bottomless, and while it certainly wasn’t flying up like Champlain Power™, it was sweet enough that I would have contemplated another run if I’d had the time. I was surprised that I didn’t see a single other person or even and skin/ski tracks while I was up there. I did see plenty of deer tracks though. The precipitation remained mixed the entire time I was there in the 8:00 to 9:00 A.M. range at all elevations, and when I was leaving, it seemed to have cooled, and any liquid precipitation was starting to create a glaze on parts of my vehicle. Back down that the base of the road (340’), and all the way into Burlington, the temperature was around 40 F, and the valley temperatures were similar when I came home in the evening. We got more precipitation today, and it looks like there’s roughly an additional half inch in the rain gauge since I emptied it this morning. I’ll get the 24-hour total tomorrow morning. The upper atmosphere warmed and was providing the mixed precipitation today, but the NWS says the 850 mb temperatures are going to come back down and change things back to snow – I’m just not sure at what point that happened, or is going to happen, but it looks like tonight based on the NWS point forecasts. The new snow that I skied this morning was pretty dense, but based on the snow depths I saw, I’d still recommend junkboards for any runs without notable sections of previous base at this point. However, reading Scott’s Bolton report from this evening, it sounds like the mixed precipitation may have really locked things up and that may change how well the new snow serves as a base. There’s more moisture to come with this system, so if this first round can serve as some extra base in places that didn’t have it, that will expand the options for turns in the coming days. Clouds built in yesterday evening, and the forecast showed the potential for a repeat of the snow we’d seen Friday night into yesterday morning. I checked the temperatures atop Mt. Mansfield, and they were about 10 degrees warmer than when the previous day’s moisture had come through, but they were certainly still cold enough to support some snow. Not expecting too much precipitation down at our location, I hadn’t even looked at the local radar during the evening, so I was rather astonished to find 0.44 inches of liquid in the gauge when I checked it yesterday morning. It seemed to have come out of nowhere. I did get a look at the recent frames of the BTV composite radar, which showed some moisture departing, but I didn’t look any further into it. The temperature was roughly 37 F at the house though, which suggested that accumulating snowfall was just a couple thousand feet up. 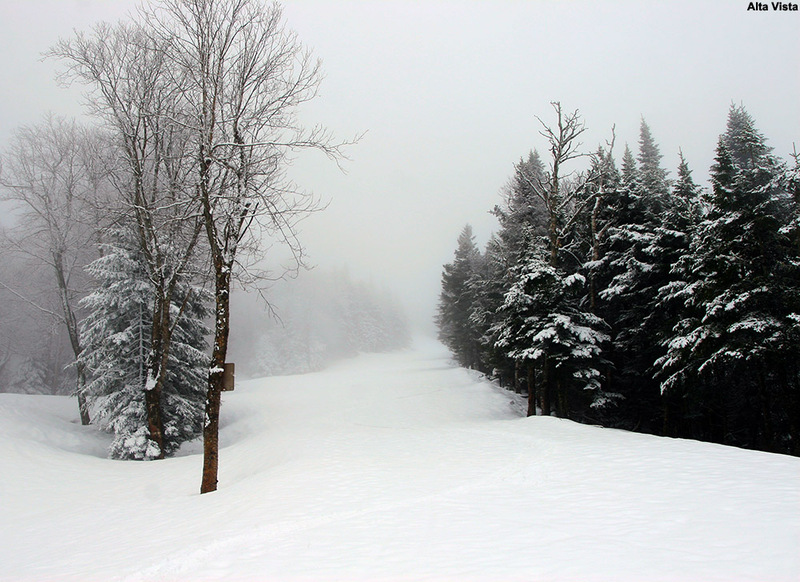 I checked Stowe’s snow report, wondering if they had gotten in on the same moisture as my location, but all they were reporting was an inch of new snow. In the highest elevations, it had been below freezing all night, so Stowe had to have missed out on some of that moisture; even with temperatures just a bit below freezing, the amount of liquid we received at the house would have produced more than an inch of snow. Perhaps Mt. Mansfield just hadn’t gotten in on the best moisture, but Bolton Valley was much closer to our location, so maybe they’d done better. We had other obligations to take care of in the morning, but maybe an afternoon trip up to Bolton was in order. When afternoon came around, Ty was the only one game for a little exercise, so he and I headed up to Bolton to check things out. There were only a few patches of leftover snow down at Timberline, and no sign of any new accumulations, but the main mountain was looking pretty good. It was obvious that there had been some new snow up there. Even though it was mid afternoon, about a half inch to an inch of new snow remained on the snowpack down at the base elevations (~2,100’). The lower flat part of Beech Seal didn’t provide continuous snow cover, and although the upper sections had good coverage for skinning, we still opted to hike to mid mountain (~2,500’). Up there, we found roughly an inch or two of new snow, and residual accumulations even in some shaded places where the old snowpack was absent. We took a snack break, and I asked Ty if he wanted to keep hiking or switch to skins; he opted to go with skins. As we worked our way up Sherman’s Pass, we met a couple of Telemark skiers that said if we were looking for powder, the lightest stuff was up near the summit. It would have been nice to head up there, but I let Ty make the call based on his energy level. 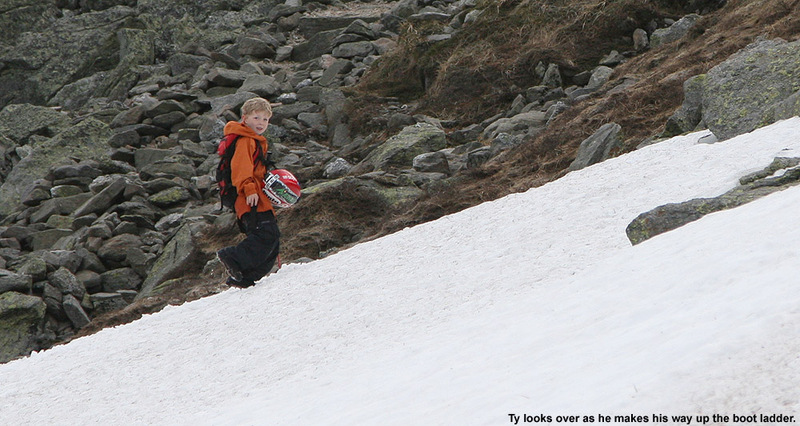 Ultimately, we skinned up to around 2,800’ on Hard Luck, to a point where Ty wanted to start skiing. We found a couple inches of new snow there, which was by that point fairly wet due to rising temperatures and the afternoon sunshine. I would have liked to know the depth of the new snow accumulations in the morning before the temperatures began to rise, as they were presumably more than what we saw. 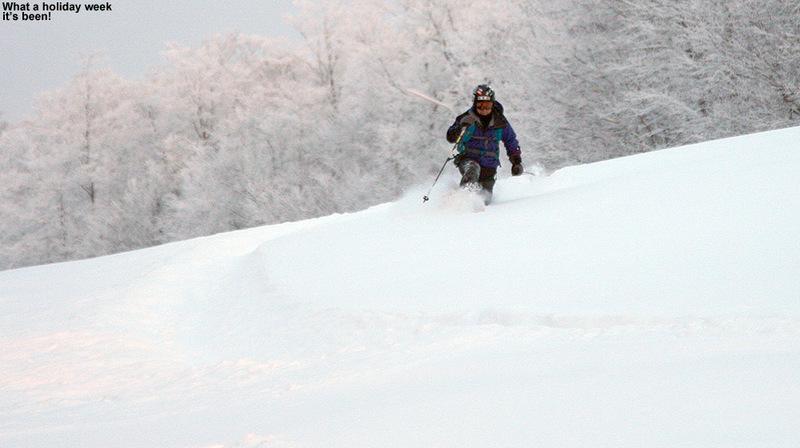 Still, like we’d found at Stowe yesterday, the new snow skied well over the softened base. 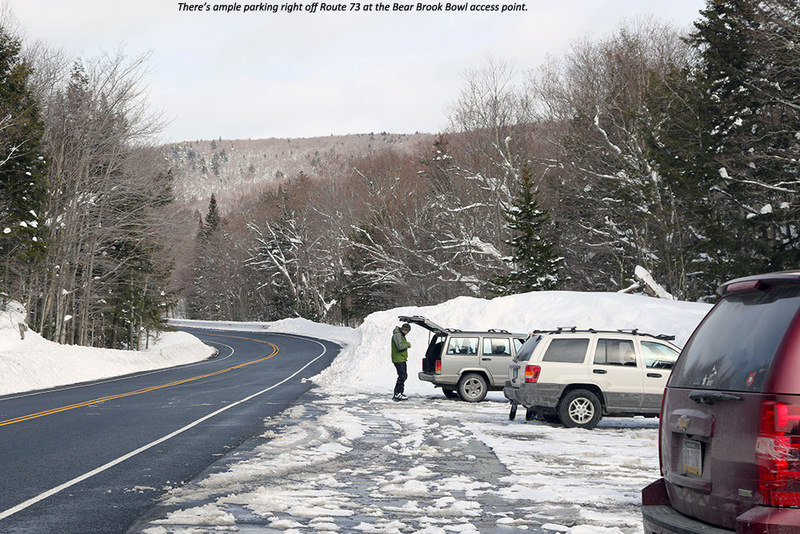 We took a route over toward Spillway, since it seemed to have the smoothest snow, and then below mid mountain we took the Bear Run route because the snow on Beech Seal hadn’t been all that smooth. 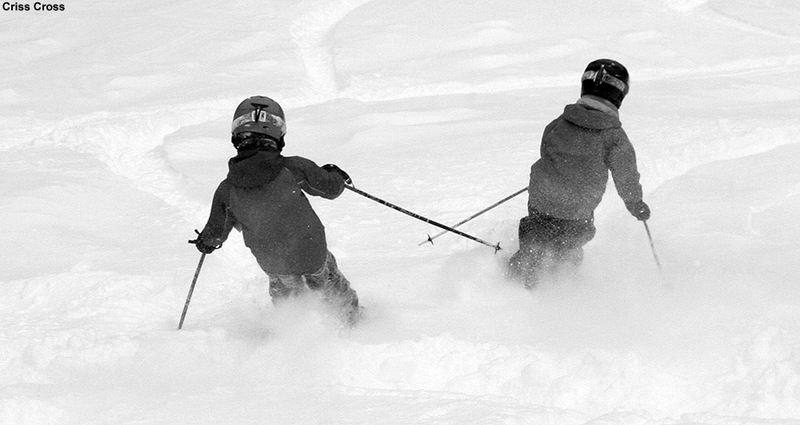 We were able to ski right back down to the base of the Mid Mountain Chair at around 2,150’. I got some pictures as usual, and Ty had E’s point and shoot camera and got a few of his own. He even got a decent action shot of me skiing, and I was impressed because that can be tough with the delay on E’s camera. I had contemplated skiing down via the big terrain park, but Ty’s choice of Bear Run was the way to go, since some areas between the terrain park features looked to be melted out. We didn’t ski Spillway above the smooth bottom pitch, but above that point it was bumpy and seemed to be continuous as Matt indicated in his report from Monday. This week’s temperatures have only been slightly above average, and the lows have been well below freezing each night so the snow shouldn’t be disappearing too fast. 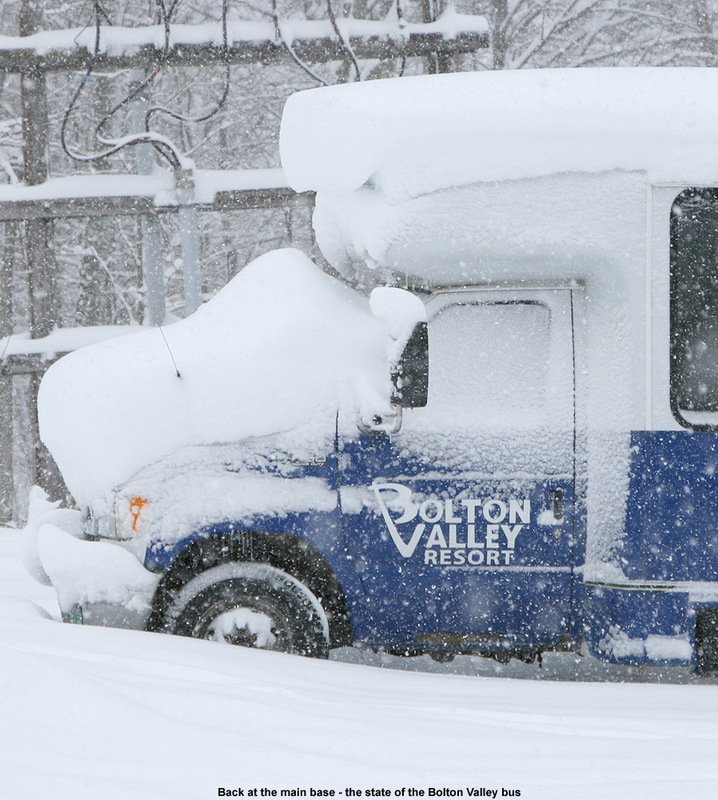 If we end up getting more snow this weekend, there should be some more fun skiing up at Bolton.